During a joint operation by combined security forces at Bordumsa, a drug peddler was nabbed at Bordumsa in Arunachal Pradesh here on Monday morning along with 7 pouches of suspected brown sugar. The drug peddler has been identified as 30-year-old Dumsa Tang of Dumsa village near Gidding in Changlang district. The recovered suspected contraband substances weighed around 35 grams. Acting on a tip-off, the combined forces of D-186 Coy of CRPF and Bordumsa police conducted a raid in the residence of the peddler near Gidding Tinali and caught him red-handed while selling the suspected brown sugar to a local consumer. “I have well understood the format on which the drug peddlers and consumers interact and promote their venomous business. 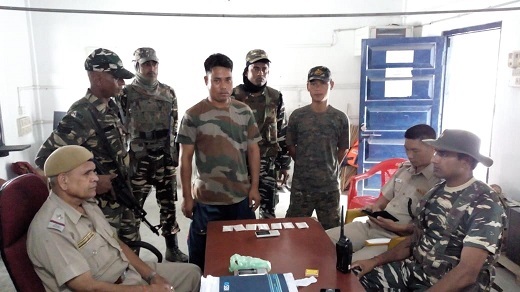 Strong and coordinated efforts alone can contain the drug menace and its unabated consumption in Bordumsa area – one of the worst affected area along the Assam-Arunachal border with porous police check gate,” said Chandeswar Prasad, Inspector of D 186 CRPF at Bordumsa. Prasad led the joint operation team. According to Prasad, the drug peddlers, both retailers and wholesalers have built a parallel network to keep an eagle eye upon the movements of the security forces including the local police so as to dupe the government agencies and escape the hammer of the law. “The unabated circulation and consumption of various forms of drugs reportedly have a direct bearing upon the stiff rise in the crime graphs of the area,” said a Singpho social activist of Bordumsa, who has also been known for his anti-drug crusades. The apprehended peddler was being interrogated by Bordumsa police.